Kimble Cricket Club are keen to attract new players and members for the upcoming 2015 season. This year the club have moved their winter net practice sessions to the excellent new sports hall at Princes Risborough School. 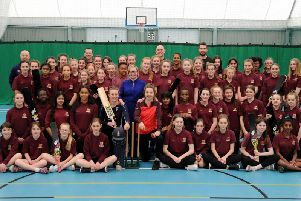 There will also be a Community Evening on Thursday, February 26, from 6-9pm at the sports hall, where you will be warmly welcome to join in with the cricket practice. Kimble currently have two teams who play competitive league cricket in the Cherwell Cricket League on Saturdays, as well as a Sunday team which plays local friendlies. The club is ECB Clubmark accredited and they are particularly keen to attract young cricketers between the ages of 9 to 15 to grow their junior section. Whether you are a former player who wants to get back into cricket or someone who is keen to try the sport for the first time, Kimble Cricket Club will provide the opportunity. There will be qualified cricket coaches on hand to support you and you can also try batting against the club’s bowling machine. All you need to bring is your enthusiasm and suitable indoor sports footwear. Players of all ages and abilities are welcome. For more information about the club, visit the website at kimblecricketclub.co.uk to find out more.